The NFL's Don Shula High School Coach Of The Year, Gabe Infante, joined Fran Duffy on the show to talk about his coaching philosophy, making the transition from high school to college football, and the traits that are most important for success at the running back position at all levels of the game. Ross Tucker joins Fran Duffy to discuss offensive line play, traits needed to be successful in the NFL, the evolution of the offseason, and some of the top prospects in the upcoming NFL Draft. Fran Duffy welcomes Eagles guard Brandon Brooks into the studio to discuss offensive line play and what wins in the NFL before getting to the premiere of Game Of Thrones and his expectations for the show's final season. Fran Duffy is joined by ESPN analyst Matt Bowen to discuss the Jordan Howard trade for the Eagles, what the veteran brings to the Philly backfield, and how he fits in Doug Pederson's offense. Fran Duffy catches up with Cornell defensive line coach Satyen Bhakta at the Scouting Combine to discuss the most important traits in a successful defensive lineman before Fran talks about the Eagles offensive line and reacts the news of Rob Gronkowski's retirement. Want one of the secrets behind what makes Free Agency go? It all comes down to people and relationships. Fran Duffy catches up with former NFL scout Dan Hatman to discuss on the latest Eagle Eye In The Sky Podcast. ESPN Analyst Dan Orlovsky joins Fran Duffy on the Eagle Eye In The Sky Podcast to discuss the impact both DeSean Jackson and Malik Jackson will have on the Eagles in 2019 and discusses the shakeup in the NFC East. NFL Films Senior Producer Greg Cosell sits down with Fran Duffy at the National Scouting Combine to discuss the value and usage of big receivers around the NFL in respect to how they have been drafted in recent years. How hard is it to find the next Alshon Jeffery? Fran and Greg break it down. Fran Duffy is joined by Josh Norris from Rotoworld and NBC Sports to discuss the keys to studying defensive linemen coming out of college when preparing for the NFL and what he looks for at the position before Fran breaks down what he saw from Super Bowl LIII. Fran Duffy is joined by Greg Cosell on the Eagle Eye In The Sky Podcast fueled by Gatorade to go position-by-position and look at this Eagles roster heading into 2019 and beyond. The Eagles came up with a last-second win over the Chicago Bears, and Fran Duffy and Greg Cosell break down what they saw from the film in that game before previewing Sunday's matchup against the New Orleans Saints. Fran Duffy and Greg Cosell go to the film for a comprehensive preview of Sunday's wildcard matchup between the Philadelphia Eagles and the Chicago Bears.  The Eagles are still alive as the Eagle Eye In The Sky Podcast continues. Fran Duffy and Greg Cosell recap what they saw from the All-22 between the Eagles and the Texans before previewing this week's must-win game against Washington as well as the pivotal matchup between Chicago and Minnesota to help determine the Eagles future. The Eagles came away with a huge victory on the road against the Los Angeles Rams. How did Nick Foles perform? Fran Duffy and Greg Cosell talk about their findings from the film room before previewing this week's game against Houston. Where do the Eagles go after a devastating overtime loss in Dallas? Fran Duffy and Greg Cosell discuss that before previewing Sunday night's matchup in Los Angeles against the Rams. The Eagles are on their first winning streak of the year after Monday's win over Washington. Where do they go from here with a pivotal matchup with Dallas on the horizon? Fran Duffy and Greg Cosell go to the tape for some answers. What got the Eagles offense going on the ground against New York? How does this team match up with Washington in a potential battle for supremacy in the NFC East? Two topics of many discussed on this week's Eagle Eye In The Sky Podcast. How do the Eagles move on from Sunday's loss in New Orleans in preparation for a pivotal three-game stretch? Fran Duffy and Greg Cosell discuss that and the upcoming matchup with New York. Fran Duffy and Greg Cosell go to the film to reveal their findings from the Eagles loss to Dallas and preview the upcoming opponent, the New Orleans Saints. How do the Eagles and Cowboys match up on both sides of the ball? How will Golden Tate and Amari Cooper impact their new teams? And what makes an elite wide receiver? Just a couple of the many topics covered on this week's Eagle Eye In The Sky Podcast. Fran Duffy and Greg Cosell talk about what they saw on film in the team's big win over the Jacksonville Jaguars and where this team stands at 4-4 heading into the bye week and the second half of the 2018 season. Fran Duffy and Greg Cosell go through their thoughts after watching the film of the Eagles disappointing loss to the Carolina Panthers and talk about where the team goes from here as they prepare for the Jacksonville Jaguars in London. Fran Duffy and Greg Cosell go over their notes after watching film of the Eagles win over the New York Giants, preview this week's matchup against the Carolina Panthers, and discuss the value of a player like Carolina's Christian McCaffrey. Fran Duffy and Greg Cosell look closely at the issues plaguing the Eagles through the last few games and what needs to be done to correct them going into Thursday night's meeting with the New York Giants. Fran Duffy and Greg Cosell go through their notes from the All-22 film in the loss to Tennessee. How do the Eagles pick up the pieces before Minnesota comes to town? All that and more is covered on the show.